The former Central Normal School served as the headquarters for teacher training for more than forty years. It was the key institution for elevating the educational level of children and formulating educational philosophy and curriculum. The School was constructed in 1905–06 from plans by Samuel Hooper (1861–1911). From 1904 to 1911, Samuel Hooper was Manitoba’s Provincial Architect. He originally trained as a stonemason and became one of Winnipeg’s foremost architects. 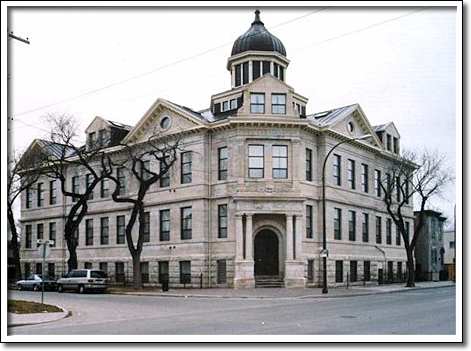 The Neo-Classical structure built of Tyndall limestone was one of four Normal Schools built in Manitoba. The others were St. Boniface (1903), Manitou (1904, demolished), and Brandon (1912–13). This imposing building was rehabilitated for residential use in 1992.